Municipal sweeping programs have come a long way from the days that only large cities had street sweeping as part of their Pubic Works programs. Back in the early days, large cities swept their streets mainly out of the need to maintain “aesthetic” goals such as making the city as beautiful and as clean as possible, especially those cities that relied on tourism for considerable cash flow back into the city’s financial coffers. No city catering to tourists wanted a reputation of being a “dirty” city. Next, major cities and towns integrated industrial power sweeping programs out of the desire for the streets to be safe for motorists and pedestrians. City Public Works programs began focusing on removing any road surface debris, like pebbles, rocks, nails and other objects that could potentially cause a flat tire to cars and bicycles or, worse, fly up and break a car window, cause an accident, or even hitting a pedestrian. 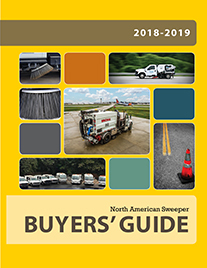 Nowadays, with environmental issues at the forefront of most concerned citizens, cities and towns all across the U.S. have come to realize the benefits of street sweeping that go way beyond concern with aesthetic beauty and public safety, as important as those concerns are. Citizens and town-dwellers are now concerned with clean air and clean water, and routine street sweeping can, and does, contribute much to keeping our water and air supplies clean and healthy. Municipal street sweeping is essential to keeping our cities and towns looking beautiful, keeping roadways safe, and protecting the environment from harmful or hazardous materials. Cleanly swept streets, roads, and highways can encourage community pride while at the same time acting to safeguard and sustain a healthy and thriving environment. Almost every town, municipality, or city that operates a power sweeping program also incorporates into their responsibilities the recycling of solid waste as part of “environmental” issues or “green” practices. For example, the city of Bakersfield, California’s solid waste and sweeping programs are “certified green” by Kern County, California, which, in partnerships with the “Keep Bakersfield Beautiful” initiative, is a “structured program that provides free tools, resources, and technical support for businesses that want a targeted approach to greening their operations.” “Kern Green” the notice continues, “is here to focus on the positive things that are happening in Kern County and to raise awareness about the individuals and businesses that are behind them.” Given today’s situation—and a real concern about the “human footprint” left in the environment—there are opportunities for municipal sweeping programs to develop comprehensive waste management programs for regular street sweeping and regular catch basin cleaning. Moreover, the rallying-cry of the environmental movement is to: “reduce, reuse, and recycle” and many municipalities have risen to the challenge. Street sweeping programs, especially those that include catch basin cleaning as part of their responsibilities, have to be very careful that the materials they bring to service stations for reuse, or even back to their stations for storing, do not pose any public risks, including hazards to water and air quality when disposing of unusable solid and liquid wastes. “We are constantly vigilant when it comes to dangerous or hazardous materials and we train our personnel on what to look for and what to do if they run into any problems” says Mike Connor, Street Superintendent of Bakersfield, CA. While oils, tars, gasoline, etc can be detected on leaves and brush debris, dangerous materials pose special problems when it comes to catch basin cleaning. • Storm water Fee Discount: Require a stormwater fee that is based on impervious surface area. If property owners reduce need for service by reducing impervious area and the volume of runoff discharged from the property, the municipality reduces the fee. • Development Incentives: Offered to developers during the process of applying for development permits. Examples include: zoning upgrades, expedited permitting, reduced storm water requirements and increases in floor area ratios. • Grants: Provide direct funding to property owners and/or community groups for implementing a range of green infrastructure projects and practices. opportunities and public outreach for exemplary projects. May include monetary awards. Commercial street sweeping contractors should be aware of such incentives because, while municipalities would like to take advantage of such “incentives” they may lack sweeping programs and hence mostly likely they will be looking to “contract out” sweeping responsibilities to independent contractors. “Green sweeping” certainly applies to the city of Bakersfield, California, where, according to Mike Connor, “there are 1,263 miles of streets in our town to sweep and keep clean of debris.” “One of the major differences between, say commercial versus municipal sweeping is that our clients are, technically, all of the tax-paying citizens of our community,” “and that is a lot of people to show that one’s sweeping program is fulfilling the communal needs for safe and fresh air and water,” Mike explains. “For our catch basin cleaning operations we use both the VacCon combo hydro/vac on a Sterling LT 8500 chassis or the Vactor 2100 series, again on a Sterling chassis, says Mike Connor, continuing “what we like about the VacCon combo is how user-friendly its operations, control systems, and servicing are.” With the “Omnibus Control System” all of the functionalities of the units are operated from a single point, and that includes both vacuum and water systems.” “It cuts down on the wear and tear of the unit as well as being economically efficient” he adds. 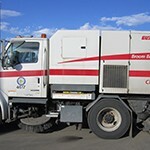 “Our Johnson street sweeper is a broom sweeper with a Cummins engine and Allison Transmission, and all of our models are automatic as well as running on CNG, including the 2 Schwarze Industries M6 Avalanche Models that we use. “We make good use of the M6 Avalanches in the fall when all of the leaves and pine cones fall and cover the road surface” says Mike. It has “an Easy Change Conveyer System™, which makes it a breeze to repair or replace a conveyer. “Or it can go from a squeegee type to a belt type conveyer on the same machine. 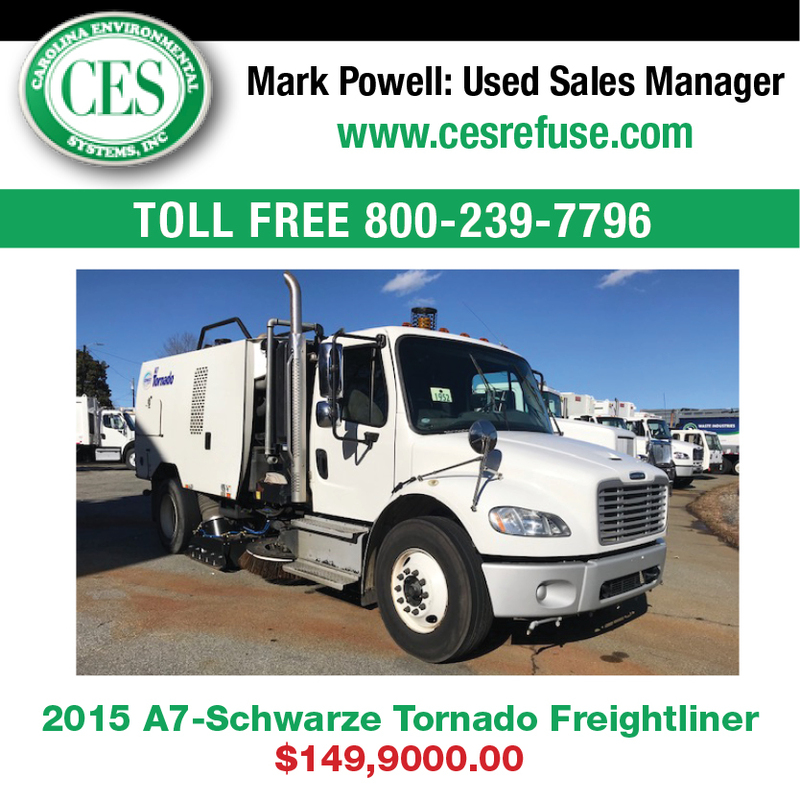 The free float, impact resistant, drag shoes take lateral impact from milling cuts, manhole covers and curbs and flexes back into place” says the advertisement on the Schwarze Industries website. For Bakersfield, “during the months of Oct thru Jan all residents are allowed to put their leaves in the street and we will pick them up. We take them to our Green Waste facility where they are used in compost” Mike says, continuing, “the way we handle going back forth to the landfill, we went with all high dump sweepers so that they can dump directly into a dump truck which then hauls all of our sweepings to the Green Waste facility where it is screened, where it can be recycled as much as possible.” “By using the high dump sweepers and dumping directly into the dump trucks, we get more sweeping miles throughout their performance besides the wear and tear on the sweepers” says Mike Connor. “Fortunately, we don’t run into too much hazardous waste in our routes. When we do, however, we will call Hazmat or Code Enforcement when the Operators see something out of the ordinary and they relay the information to the Hazmat Teams, who take it from there.” Bakersfield’s leaf program is aimed at keeping the City’s water system in good operating condition “by decreasing the amount of debris that gets into storm lines and storm pump stations” Mike concludes. The mission statement of the Street Sweeping division of the Public Works of Redding, California is right in step with what we have seen so far in terms of most municipal sweeping programs and their commitment to their community and to the environment. It reads “Our goal is to provide quality and cost-effective solid waste and recycling services citywide, through a balanced combination of services by contract and municipal forces,” explains Paul Clemens, the town’s Utilities Manager. 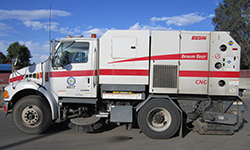 In developing their comprehensive plan for the management of street sweepings and catch basin cleanings, the town of Redding, California takes advantage of, “in-house,” three Tymco Model 500x street sweepers. “We use two on a regular basis, and keep one as a spare just in case one of the regular sweepers brakes down for whatever reason” says Paul. “If a special event has taken place in town, a parade for example, we are confident that we can sweep everything up and return it to clean space” Clemens adds. “We sweep all commercial areas in town on a daily basis, and for residential areas the streets are swept every month.” In order to streamline and make more efficient the heavy times of the year, like the fall, the Public Works department has Staged Drop Boxes where the Tymco’s can dump their loads, and it is only when a huge container is full, which are 20-30 yards long, do they take the debris to the designated dumping areas for recycling or disposal. Just as the other Municipal sweeping programs, the town of Redding, CA also makes available compost materials, and other reusable products, for the citizens of the town. Typical of most municipal street sweeping programs, Redding supplies all citizens with 2 green recycling bins, one devoted exclusively to “yard trimmings, grass, and small twigs, which the street sweeping program then picks up and brings to the local landfill for using in composting.” The town’s “green initiatives” accept grass clippings, tree branches that are shorter than 3.5 feet, leaves, yard trimmings, an un-flocked Christmas trees, that must be cut into sections again, no longer than 3.5 feet. In most northern, especially heavy industrial, cities of the U.S., winter brings with it huge snow storms and, among the many difficulties municipalities have to confront when it comes to snow, the one that most people don’t think about is when the winter is over and spring is beginning. 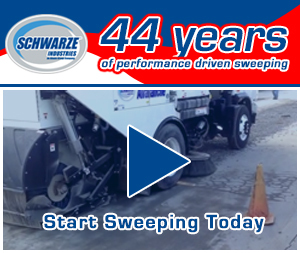 During the harsh winters street sweeping and catch basin cleaning are often cut to a minimum, and that translates into extra-heavy accumulation of sand, gravel, salt, and traction sand. However, southern states must also deal with winter and the cutting down on sweeping services. 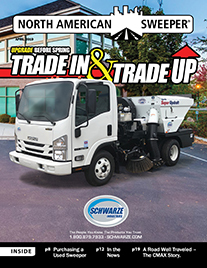 “All of our sweepers work well for us” says Leroy Brooks, Longview, California’s Streets and Drainage Manager, “but one of the reasons we use multiple manufacturers is that we find certain sweeping trucks are especially suited for one application, and one kind for another. For example, our Schwarze A7 Tornado sweepers are good for leaves and pine cones whereas Tymco’s are better for dealing with heavy, water logged sand or silt” Brooks says . Because this material is often very compact, heavy and dense, “it requires a truck with mechanical brooms sturdy enough to dig it out then break it up in manageable chunks so that it can be sent to the hopper without dropping any excess debris in the process” Brooks reminds us. The way they do it on the west coast is the same way they do it on the east coast. Take for example, Delaware County’s Public Works program, located right outside of Philadelphia, Pennsylvania. While the sweeping division is responsible for sweeping all of the leaves and fallen debris during the autumn season, from loose leaves to piles of leaves left on the side of the road by citizens, the county, just like Redding, California, operates a well-structured system of “Transfer Stations” where leaves are dumped for compost and where citizens can come, free of charge, and use as much compost and mulch needed as for their gardening and landscaping “until the supply is exhausted. It is safe to say that municipal sweeping programs have come a long way from just being concerned with keeping their towns beautiful, to instituting full-blown street sweeping programs that protect the town’s water supply, and its citizens’ health and well-being, by regular street sweeping and catch basin cleaning.